It’s that scary time of year when our minds turn to witches, goblins, ghosts and ghouls . . . and things that go bump in the night. For the meeting planner, many things can go bump during many nights; these being the scary number of details involved in planning an event. Here is how to put those bumps to rest once and for all. That Which You Cannot See: You may not be able to “see” it, but you need it – and that is WiFi. Here’s a quick read on WiFi terminology, along with what to know when it comes to keeping your attendees well connected at your event. The Unknown Villain: Meeting planners have files upon files of information and processes that they rely on to keep their events running smooth. If some entity were to steal that information and hold it for ransom – oh the horror! Stay protected and learn a few tricks to keep those ransomware-wolves away. The Empty Halls: The nightmare of no one showing up to an event is one that many a meeting planner has had. Don’t let this nightmare cross the lines into reality! Learn how to ensure that a meeting’s General Session are closer to standing room only than to plenty-of-seats, with these 2 past blogs; Part 1 and Part 2. Bats in the Budget: Keeping within a budget can cause a lot of sleepless tossing and turning. Check out this blog on how to get through budget cuts and come out looking like a million bucks. It Could Happen to You: The best laid plans do not guarantee that all will go off super fabulously well. In the case that all heck breaks lose, be prepared to handle it well and handle it right away. Strangers in the Night: Guests tend to enjoy an event all the more when they get to know each other. Make it all happen on the quick with these ice breakers. Drag Me to Hell: And now a friendly reminder from your buddy, Jill Stone. We are an overly busy group of people with highly stressful positions and a crazy amount of balls to juggle. Don’t allow your meeting planning to drag you down, remember to take care of you so you can get the full night dreamy deep sleep you deserve. Happy Halloween, Meeting Planner! 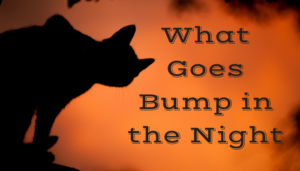 May you have many less bumps in the night!